Anyway, this scrumptious Chocolate Chip Mandelbread comes with a story. We (meaning my grandmother and I) weren’t even planning on making these cookies for our Passover dinner until we got a text from my aunt. It read something along the lines of every holiday comes with its incident, and this year the incident was mine, followed by a tale of mandelbread gone wrong. My poor aunt had mistakenly baked her bread in a loaf pan, cooking the sucker for 2 hours before figuring that it was probably done. But alas, when she dumped it out onto the counter she wound up with a chocolate puddle. So my grandmother and I decided to try to tackle this mandelbread. We used one of her many recipe cards, and as a result I do not know where this recipe is originally from. But here it is anyway. Here’s our cast of characters for today. 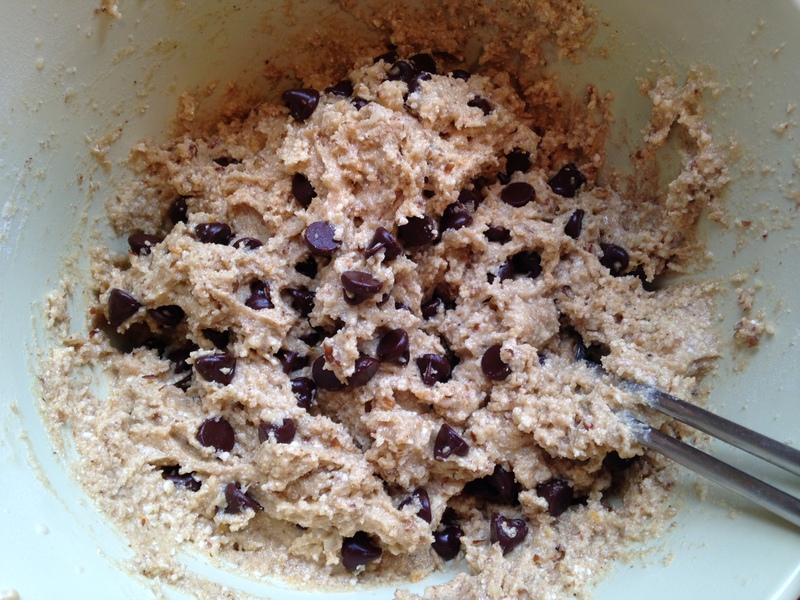 Man, I love baking with chocolate chips. Let’s just say a few usually end up jumping out of the bag and into my mouth. Completely of their own accord, of course. Let’s start with our eggs. Crack them into a large bowl and add the sugar. Beat these until they’re thick and pale yellow. Then stir in your oil and water. Set that aside for a minute and grab another bowl. 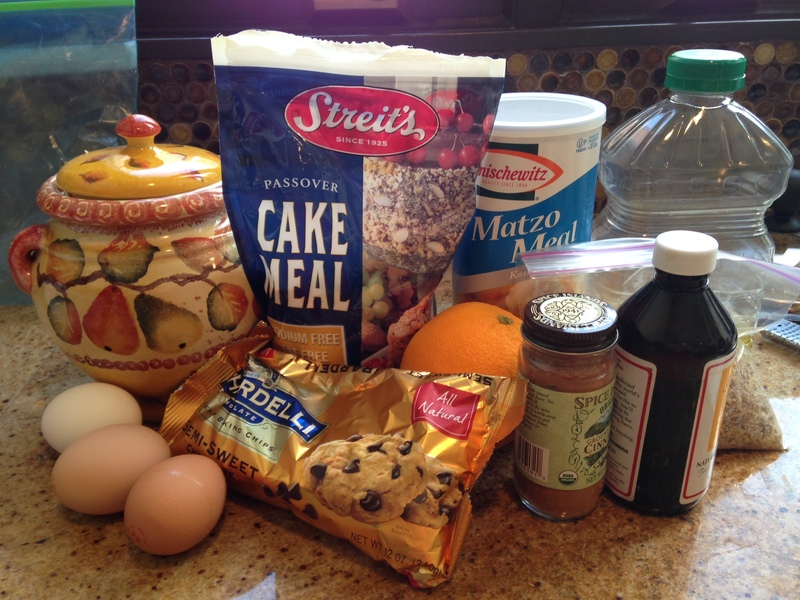 Throw in the zest, salt, matzoh meal, and cake meal. Well, don’t throw it. Unless you want a mess. And then the nuts and the chocolate. Yum. 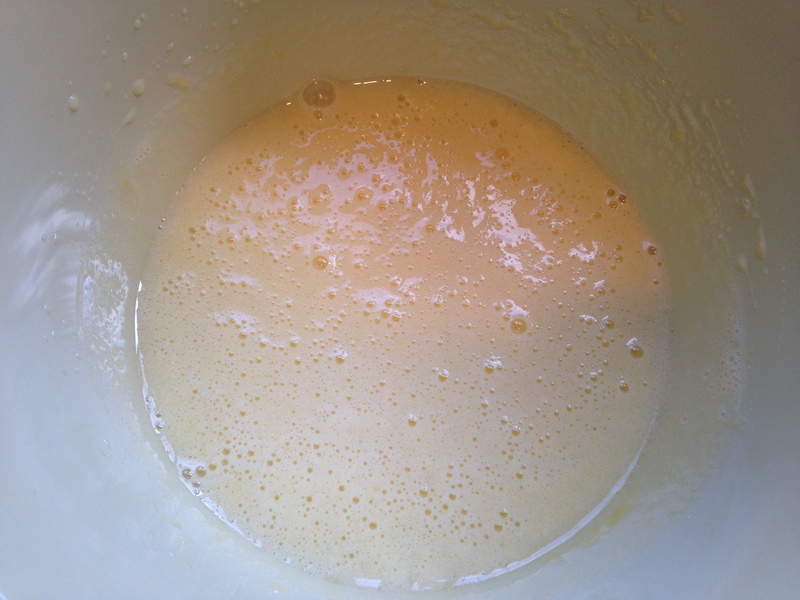 Let this batter sit for 15 minutes on a high shelf where you won’t be able to eat it. Or, if you’re like me, keep it right in front of you on the counter and nibble on it. Then nibble on it again. Oh, there are raw eggs in it? Hey, you only live once, right? 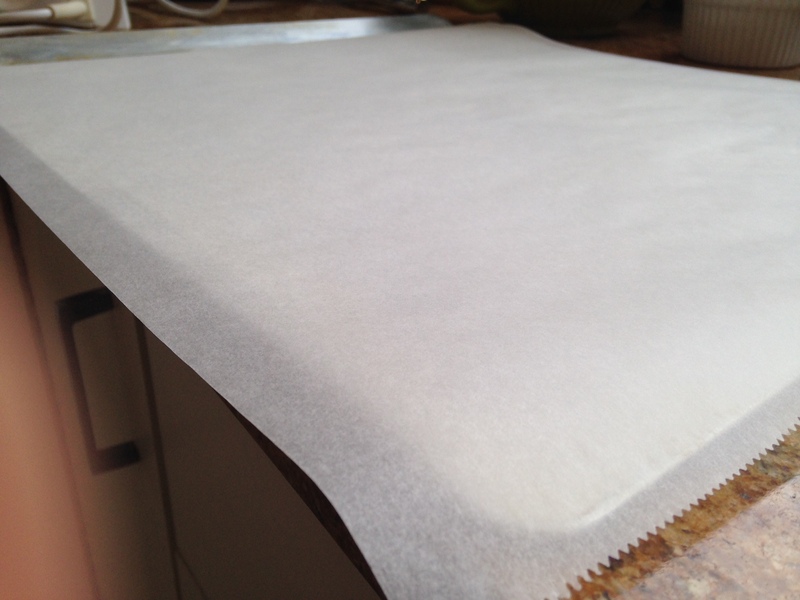 Ok, while that’s sitting let’s go ahead and prepare a cookie sheet by lining it with parchment paper. You could also grease it. 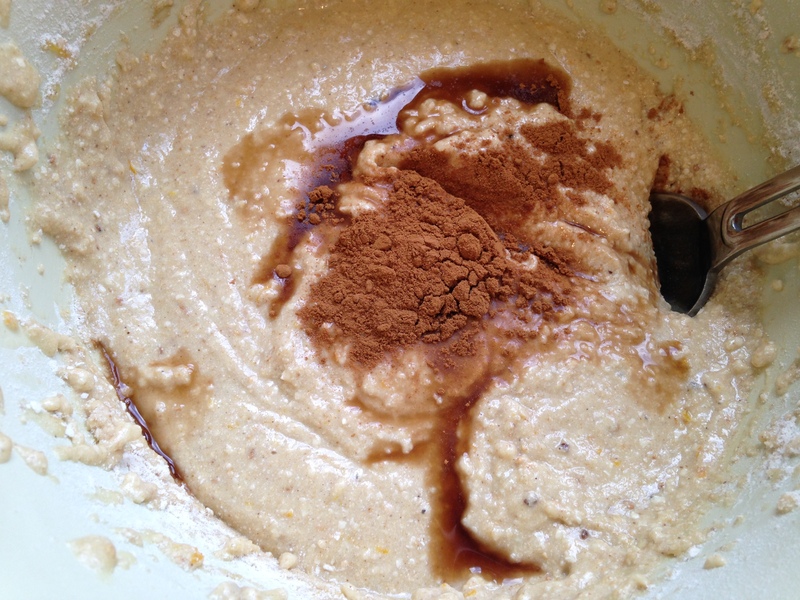 And while we’re waiting we might as well mix up some cinnamon sugar to sprinkle on the cookies. 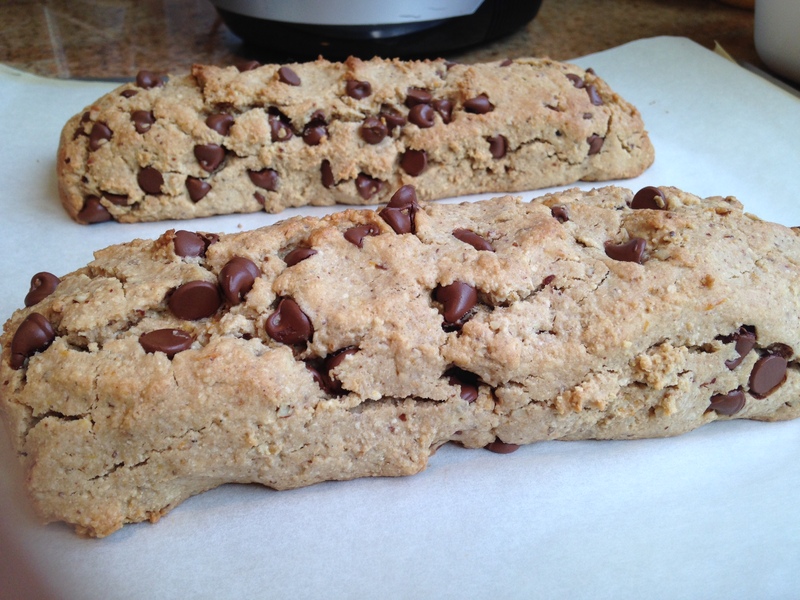 When the dough is ready, divide it into 2 equal parts and form them into logs. These should be about 1 1/2 inches wide and 12 inches long, but mine were definitely a bit wider. You’ll want to leave some space between the two. Bake for 25 minutes. They look pretty great, don’t they? But we’re not done yet. Let these sit for 8-10 minutes so they won’t crumble when we cut them. Now we can slice! Cut them CAREFULLY on an angle, and try not to make them too thick, or so thin that they crumble. You’ll notice that they’re still soft, but that’s OK! We’ll be toasting them shortly. That’s my grandmother’s hand in the background, in case you were wondering. Lay the cookies out on your sheet and sprinkle with the cinnamon sugar you just made. Stick ’em back in the oven for 10 minutes to crisp up. After that, pull them back out, flip them over, re-sprinkle (is that at word?) and put them back in for another 5-10 minutes. 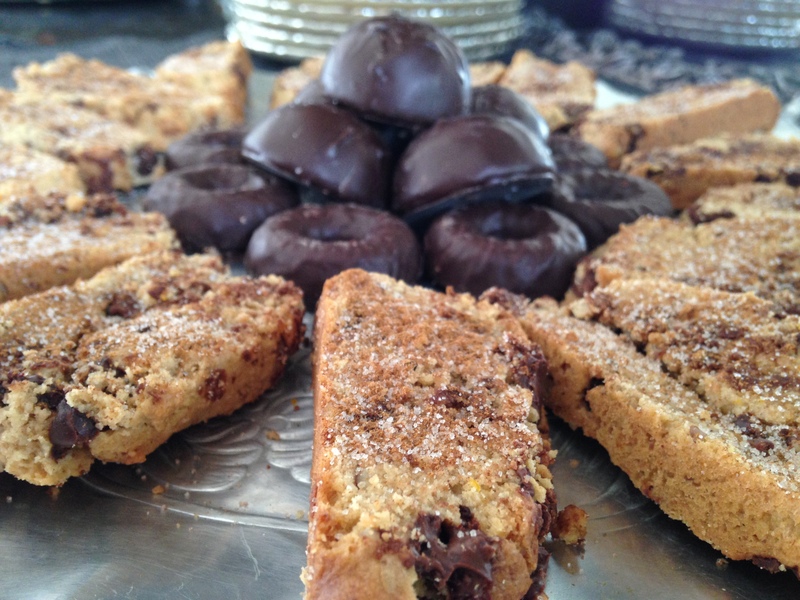 The cook time all depends on whether you want a slightly soft cookie or one that’s more biscotti-like. Just cool them down, serve them up, and you’re done! We stored ours in a plastic bag, but you could also put them in a plastic tupperware. Makes 2 loaves. Amount of cookies depends. 2. 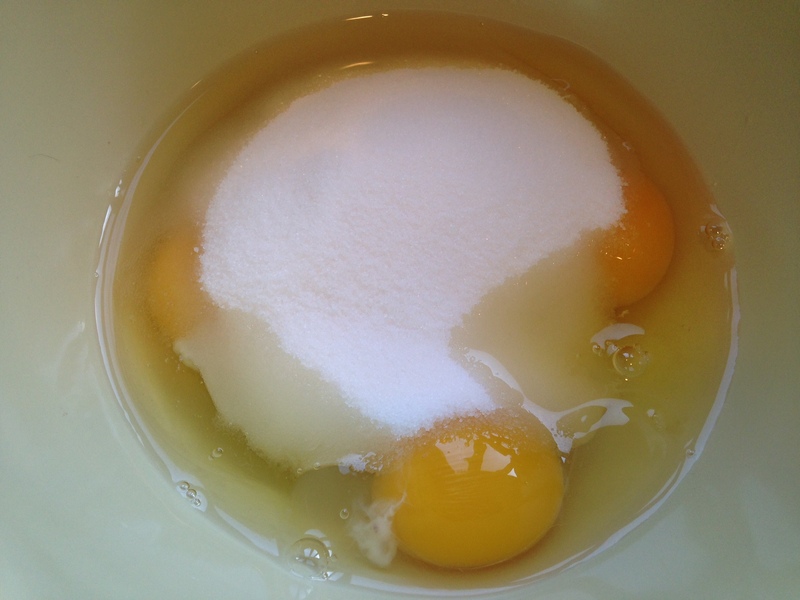 In a large bowl beat eggs and sugar until thick and pale yellow. Stir in oil and water. 3. 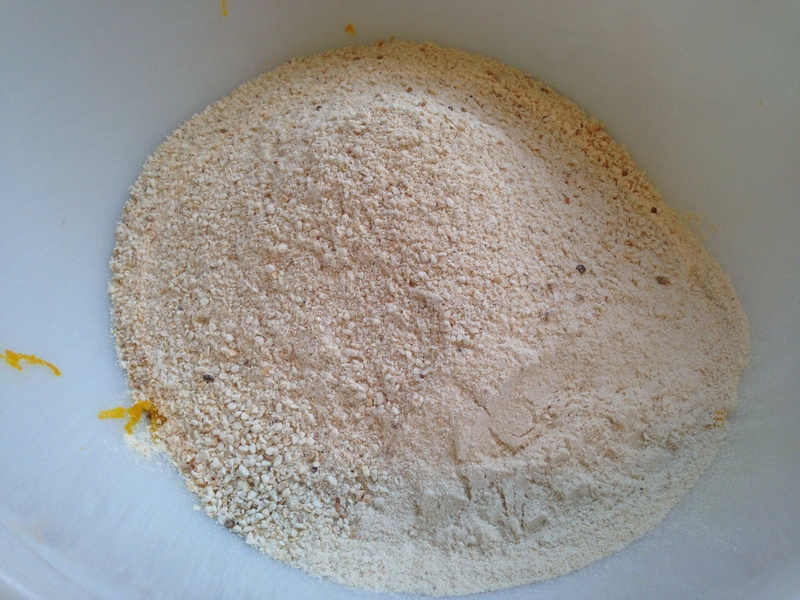 In a separate bowl, combine zest, salt, matzoh meal, and cake meal. Add this to the wet mixture. 4. 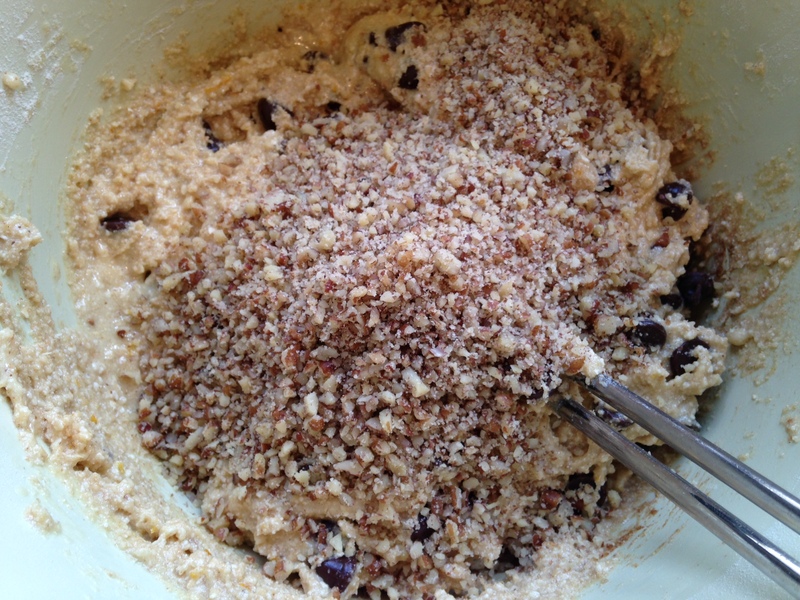 Stir in cinnamon, vanilla, chocolate chips, and nuts. 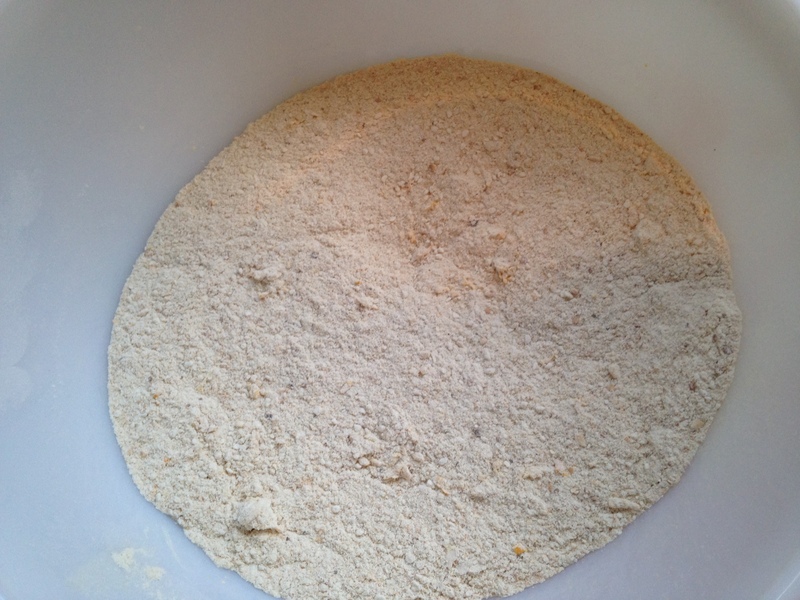 Let batter sit for 15 minutes. Meanwhile, line a cookie sheet with parchment and mix up some cinnamon sugar. 5. 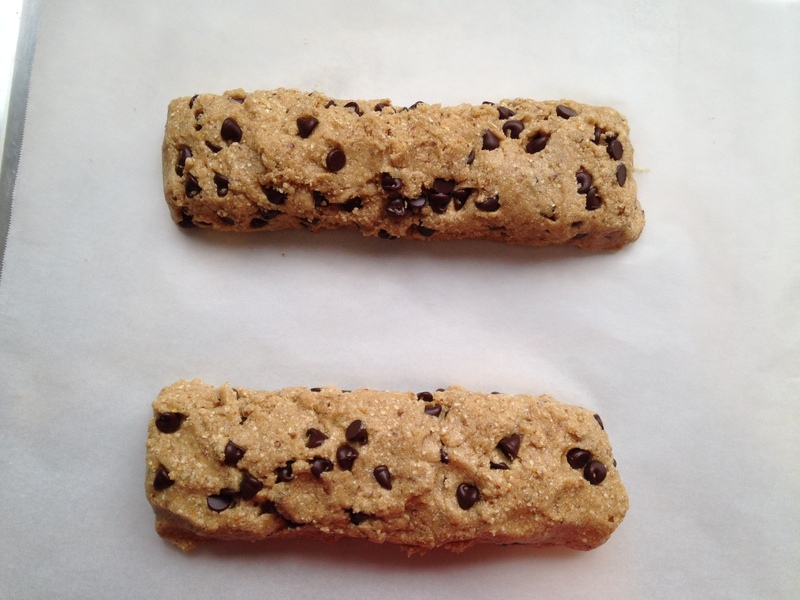 Divide dough into 2 equal parts and form into logs (about 1 1/2 by 12 inches, though mine were wider). 6. 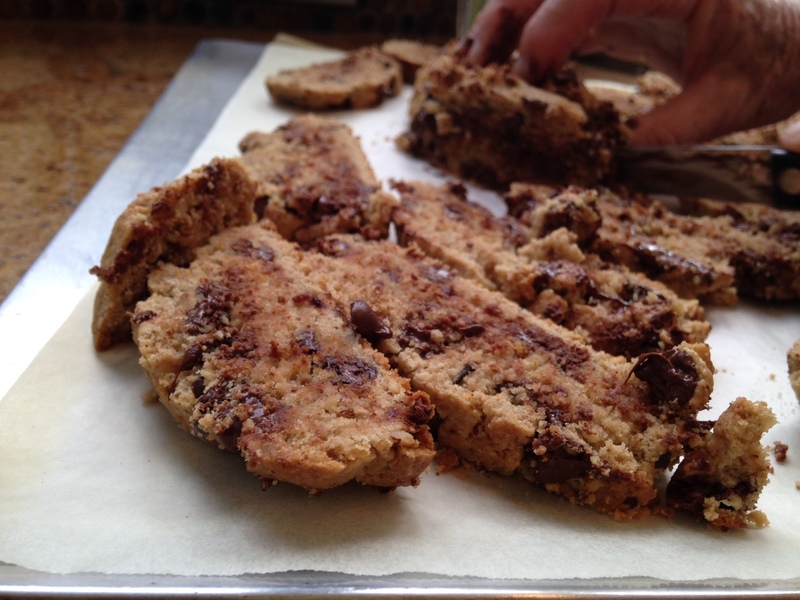 Place logs on the cookie sheet and bake for 25 minutes. Cool for 8-10 minutes. 7. Slice on an angle and lay out on the cookie sheet. 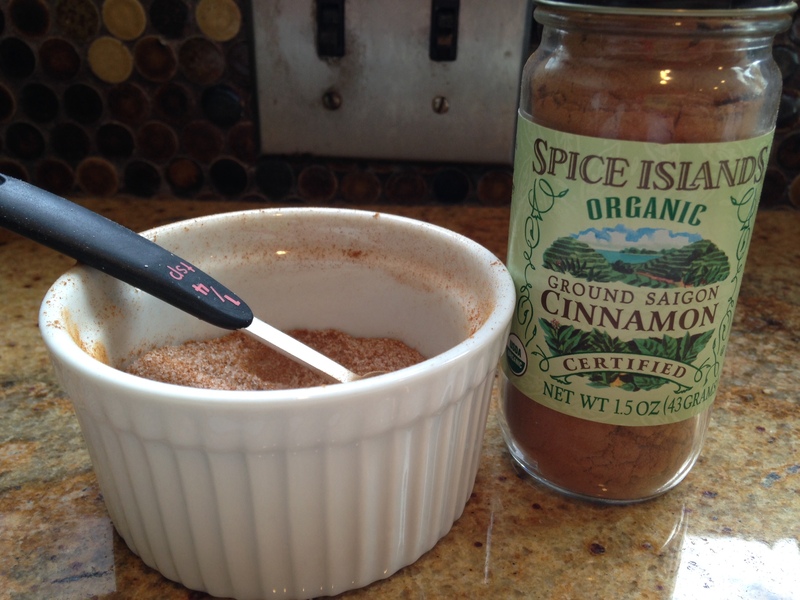 Sprinkle the tops with cinnamon sugar. Bake for 10 minutes. 8. 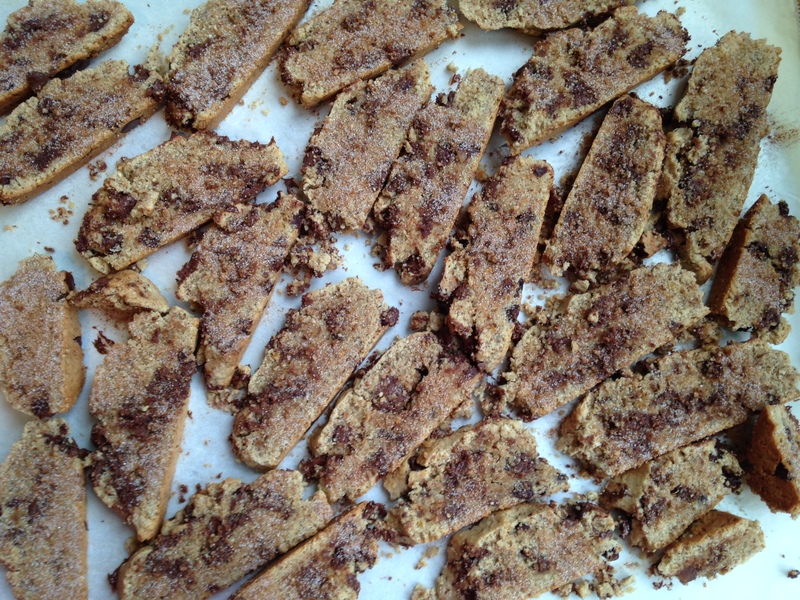 Once out of the oven, flip cookies and sprinkle other side with cinnamon sugar. Put back in the oven and bake for 5-10 minutes.